It is a unique and exciting self-help educational movement for people no longer in full-time work (the Third Age). It offers the opportunity to pursue learning for sheer enjoyment and for its own sake. U3A stands for University of the Third Age and is part of an international network. 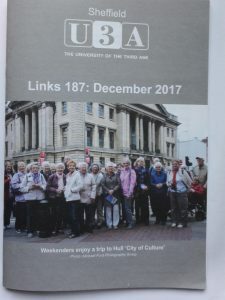 Who can join Sheffield U3A? Anyone in the Third Age can join. There are no entry qualifications – all you need is interest and enthusiasm and the willingness to join in group activities. We have members not students. Groups are formed whenever three or more people share an interest, and a coordinator can be found. But if you don’t want to join a specific group, we have other activities and travel opportunities for all members. All U3As set their own annual subscription, part of which is paid as a capitation fee to maintain our national office. The subscription in Sheffield is £8 a year. Individual groups may make a small charge to cover administration and expenses such as room hire.